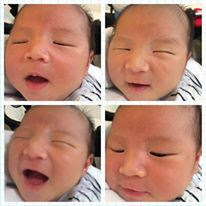 This photo was taken during his first pedia check up, if I remembered correctly..he's around 2 weeks. I miss blogging and i think i can blog again. Fingers crossed, I can blog this weekend! i have tons of photos and drafts! I'm happy to touch the keypad of the laptop again too! haha!